LiveArt now offers integrated module of online product designer for owners of Magento platform. Enable product design capabilities on your website with LiveArt HTML5 that runs on tablets, mobile smartphones and desktop computers. Integrated product designer allows customers to decorate your product with unique artwork or text and receive instant proof. 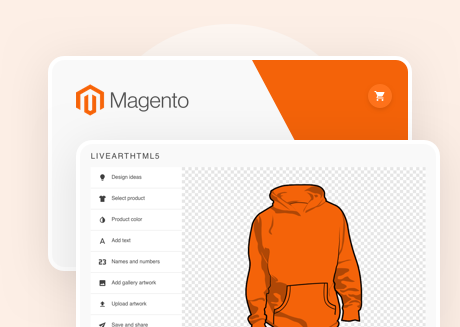 Power-up your Magento store with LiveArt HTML5 Online Product Designer. A designer component can be integrated in a standalone application that will allow your customers to configure and customize your product online with instant proof. LiveArt HTML5 is compatible with most of the standard Magento themes including responsive ones for tablets and smartphones. Make customization process easy. No more endless list of drop-downs!